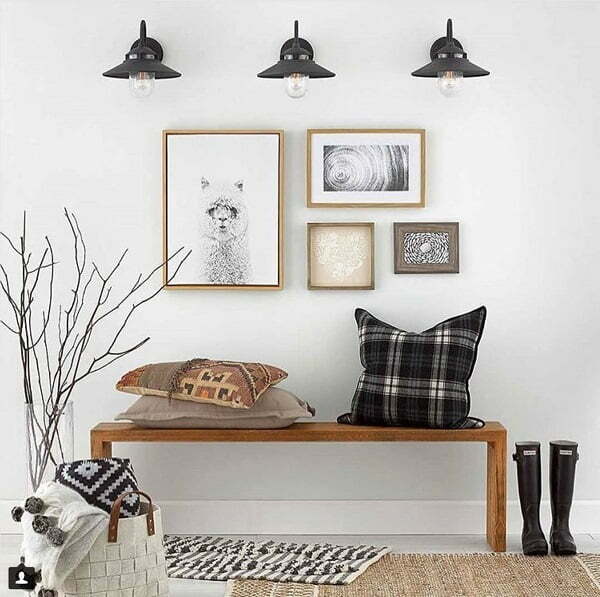 Looking for farmhouse lighting ideas to add charm to your decor? 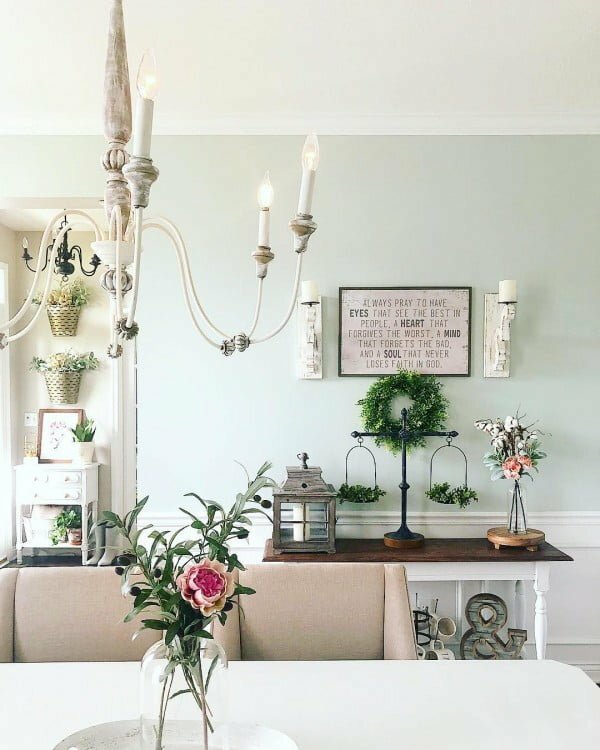 Here are 21 creative style ideas and lighting fixtures that will turn your space into a farmhouse fairytale. 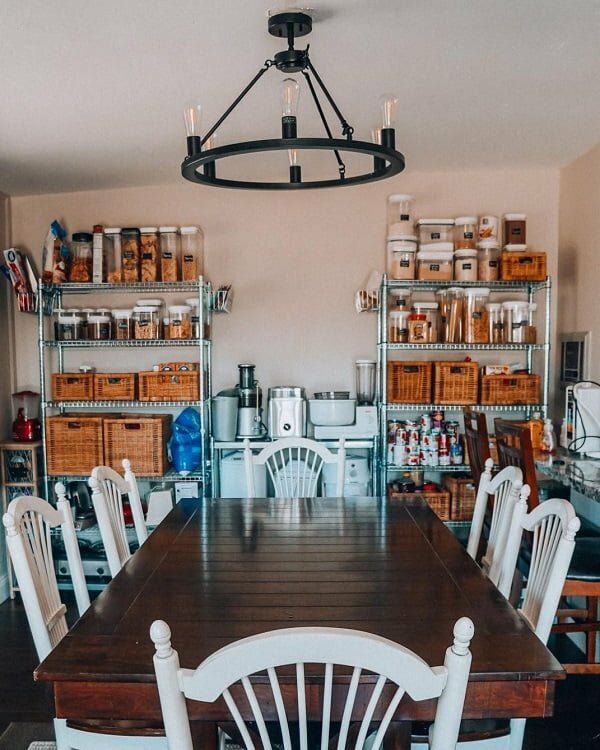 When you’re creating the farmhouse style decor, lighting comes as one of the primary points of your project. It’s really important to get it right as it can make or break your entire interior design. 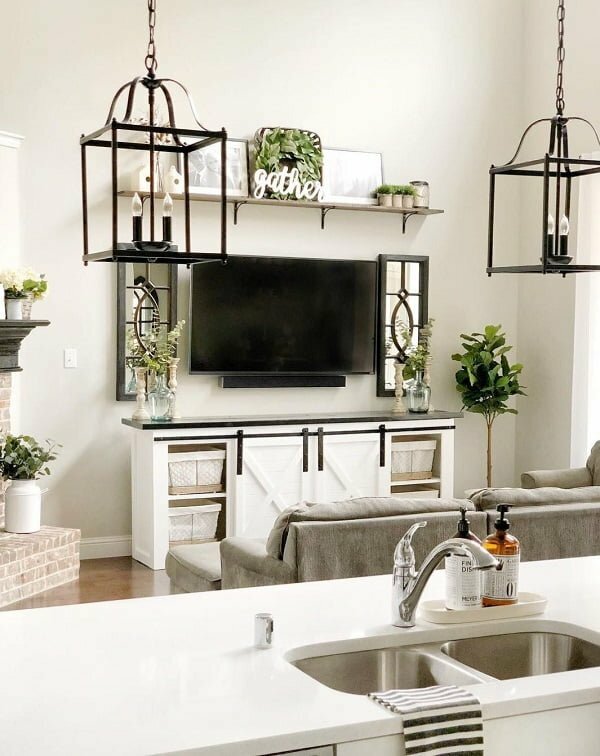 Luckily there are so many options that can make excellent farmhouse lighting and bring the whole style of the place together. But what defines farmhouse lighting? Usually, it’s the rustic natural wood elements or metallic accents, the use of candles and vintage accessories. You’re not limited to just those options, though – there are so many more ways to create terrific lighting. And here are 21 creative and very different ideas that will get your creativity flowing. This wood beam pendant is as much rustic as it is whimsical. A sizeable wooden beam in a cherry wood stain is used to hold several light bulbs twisted around on wires. 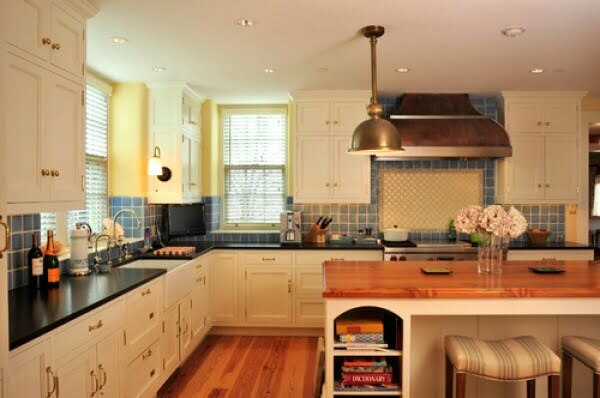 It’s certainly the focal point of this kitchen, and it offers so much decor value. 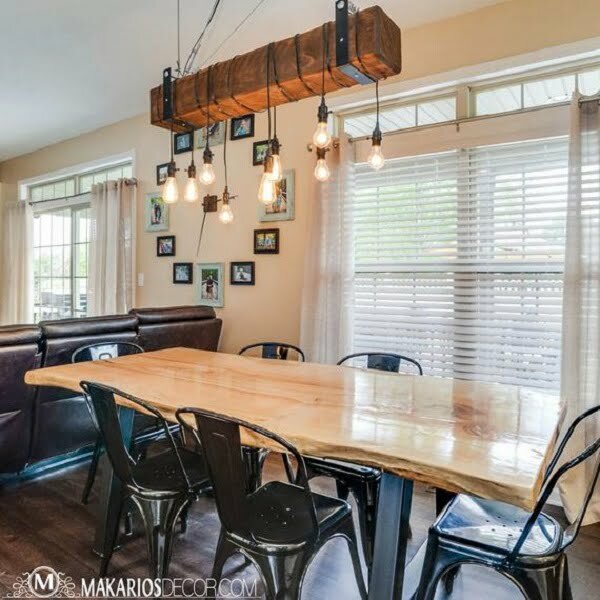 Here’s another idea that makes use of rustic light bulbs hanging on a wire. It also makes use of reclaimed wood plank as the basis for a chandelier. The overall look is a neat modern farmhouse with a lot of warm rustic accents. 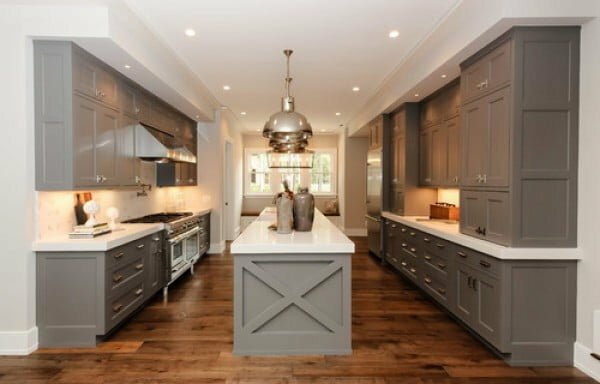 These luxury lighting “gleams” are being used in modern farmhouse design kitchen and they make a great accent. 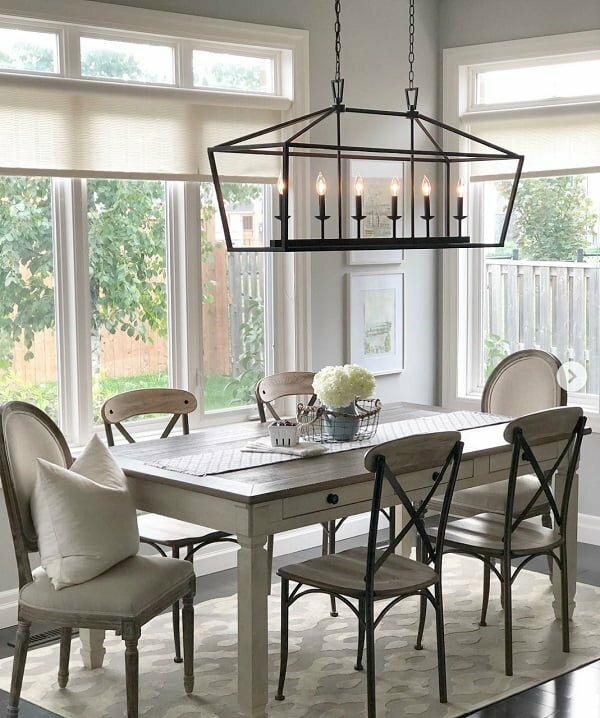 While this chandelier can be used in any contemporary decor, farmhouse style makes it pop out and can even serve as the focal point of the room. 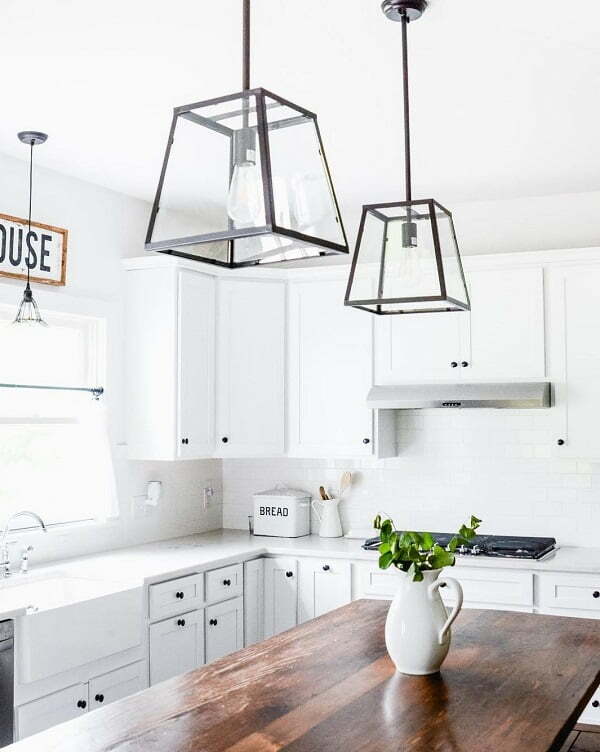 These satellite pendants make this farmhouse kitchen decor click. The round glass pendants make the whole interior design look interesting. 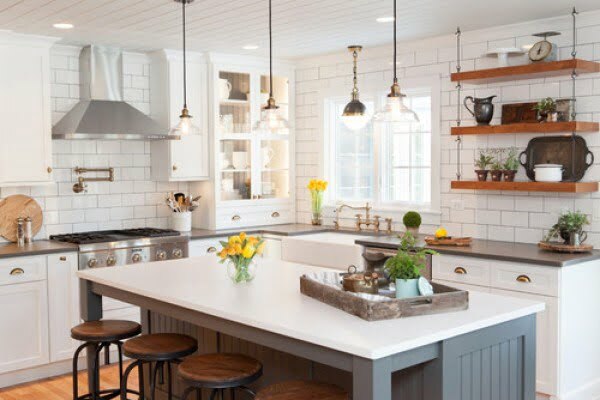 It’s a great example of how you can create contrast against subway tile and open wooden shelves in kitchen decor. Dome pendants make another excellent farmhouse lighting option. They can work as accent pieces or even as the focal point on their own. This kitchen design enjoys the use of these metallic pendants as they bring the whole interior design together. 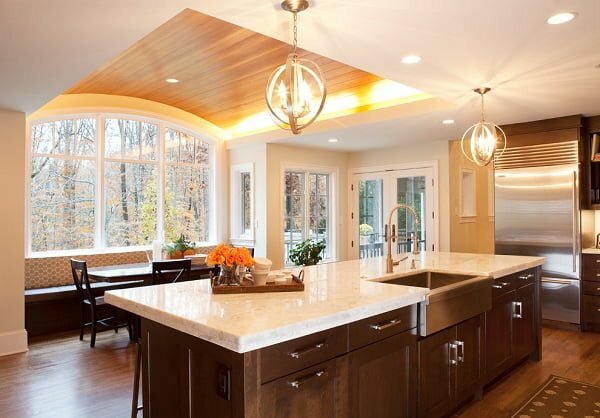 This spacious kitchen is superbly lit with a stunning combination of pendant and recessed lighting. 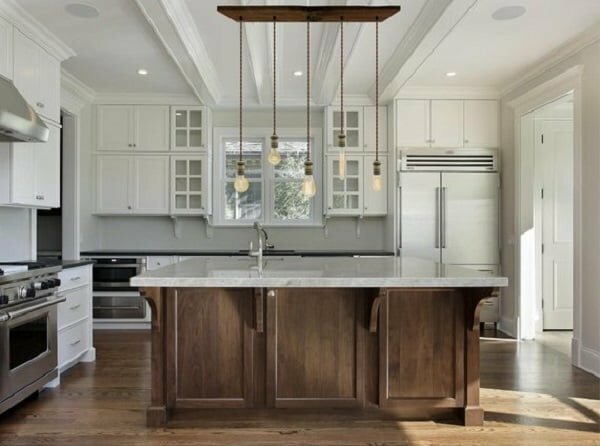 The pendants are strategically placed over the island, the sink and the range to serve as task lighting. This space is well lit with square lanterns and recessed lights, making it ideal for preparing delicious meals. The contrasting color of the kitchen island adds a soothing visual impact. 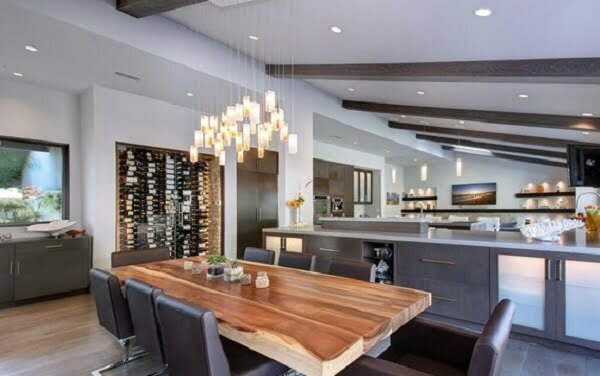 The lighting in this spacious and superbly designed kitchen is taken care of by a combination of fixtures. These include sconces, recessed lighting and a unique vintage pendant suspended from the ceiling. 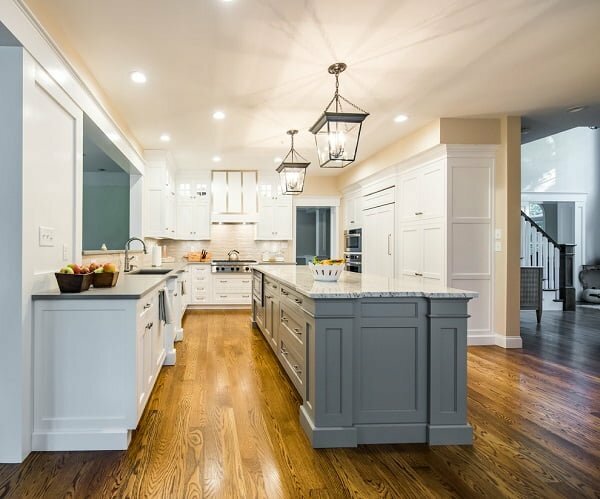 The recessed lights and votive lanterns hanging from the ceiling over the kitchen island beautifully combine to bring an enchanted look to this remarkably designed kitchen. 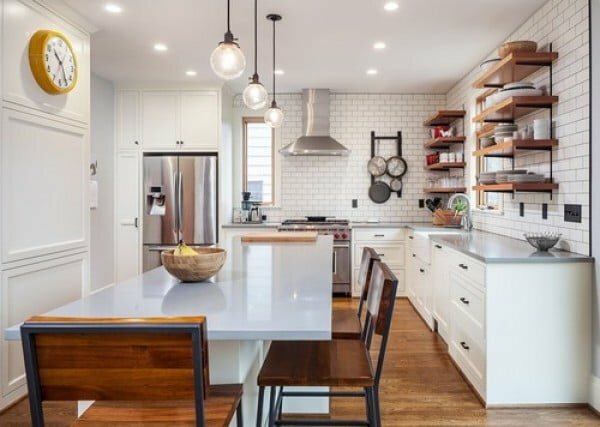 The gorgeous design of this farmhouse kitchen is greatly enhanced by how wonderfully space is lit. The recessed lights and intricately designed globe chandelier lighting perfectly showcases the area. 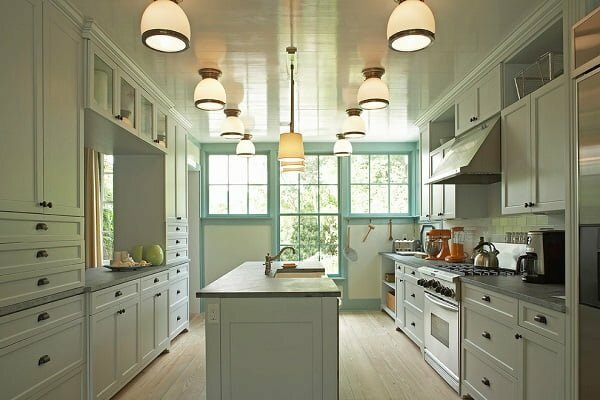 The pendant lights over the kitchen island are surrounded by two rows of Edwardian flush mount lights. They combine to bring a light and airy vibe to this stunning space. The staple piece light fixtures make quite the statement in this space. The matte black color of the fixtures remarkably complements the décor of the living room. 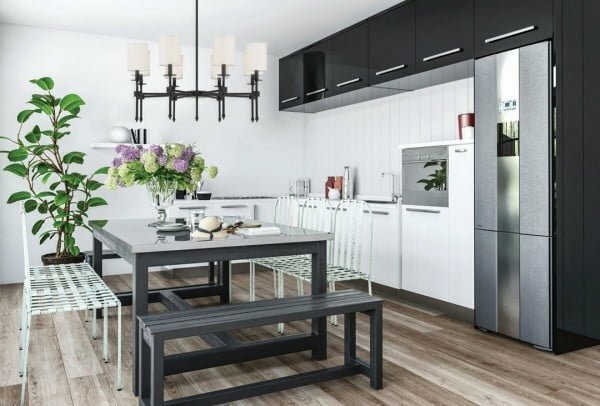 Lit by pendants of different shapes and sizes, this immaculately designed kitchen exudes a welcoming crispness that seemingly promises a lot of good food and good times. In a space filled with gorgeous details via its accessories, this large glass pendant light fits in perfectly. It provides beauty and function without taking anything away from the design. 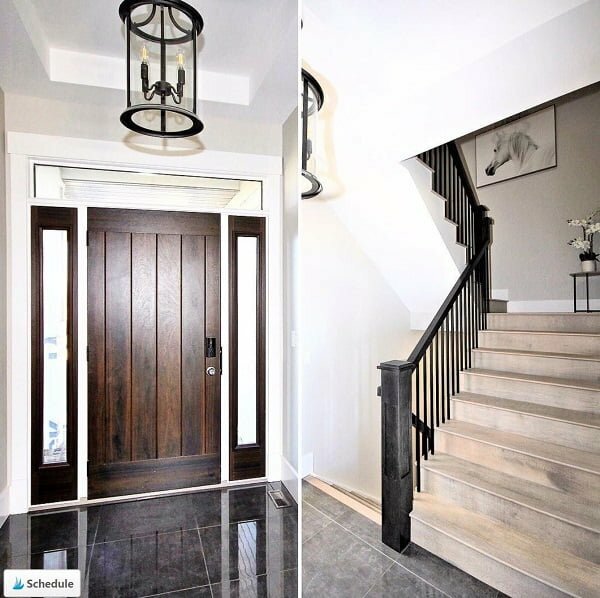 The details of the entryway into this breathtaking space are illuminated by this gorgeous light fixture. Suspended from the tray ceiling, this light is as spectacular as it is functional. The trio of wall sconces in this space serves as spotlighting for the exciting wall art. They effortlessly bring a modern element that complements the overall design of the area. This beautiful and fascinating lighting fixture has a remarkable impact on this striking and functional storage space. It seamlessly injects some amount of character into the area. 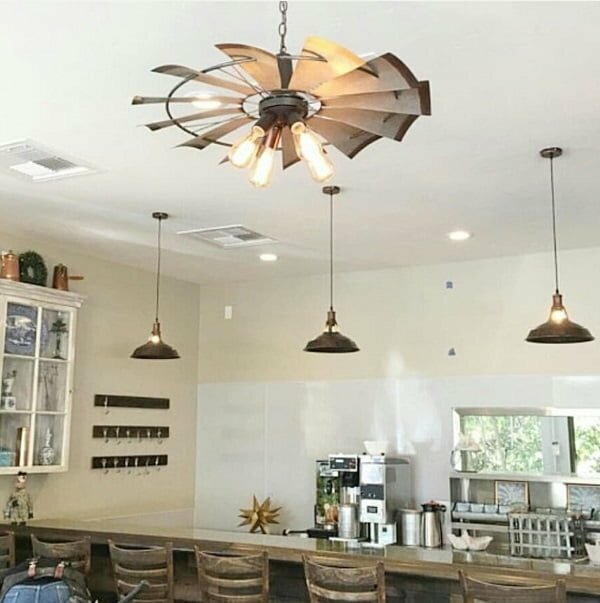 The combination of pendants, recessed lights, and the beautiful windmill chandelier go a far way in bringing exceptional illumination, functionality, and interest to this space. This gorgeous chandelier serves as the perfect complement for the table over which it is suspended. Its black color brings out the color in the backs of the dining chairs and the hardware on the table drawers. The warm lighting effect of this beautiful chandelier does much to contribute to the light and happy atmosphere that emanates from this space. 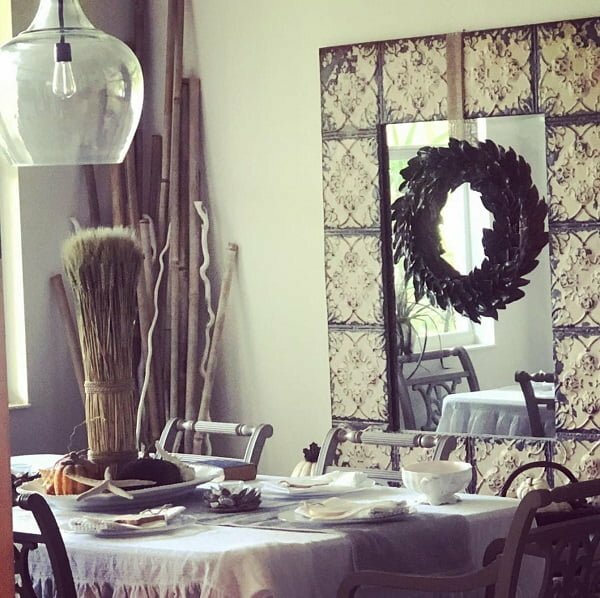 Its visual appeal and functionality help to create a relaxing ambiance in this natural and craftily designed dining room. Finished in black, this Chatham 8-light chandelier, with its bright white shades, delivers a seamlessly sophisticated look. This makes it an ideal selection for illuminating different spaces around your home.